Abarth - the tuning arm of Fiat, has added the optional performance esseesse pack to the Punto Evo. The performance kit, which increases the 1.4-litre turbocharged engine’s power to 180bhp, can be chosen with a new car, or can be retro fitted - as long as it’s within 12 months or 12,500 miles and carried out by an Abarth appointed dealership. It costs £3000. The engine’s Electronic Control Unit (ECU) gets upgraded so that the 1.4-litre turbo unit produces 180bhp at 5750rpm. 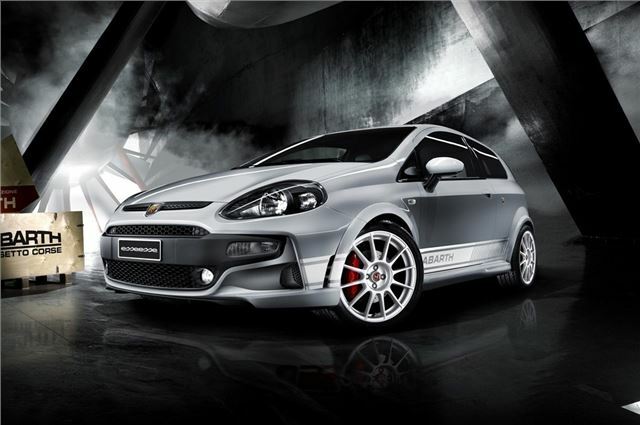 This gives the Abarth Punto Evo esseesse a 0-62mph acceleration time of 7.5 seconds and a top speed of 134mph. Braking is improved with Brembo front callipers while uprated Abarth springs and Koni FSD dampers are fitted front and rear, which results in a lower ride height. A six-speed manual gearbox provides the transmission, and the car features Abarth’s switch to transfer from ‘Normal’ driving mode to ‘Sport’. The esseesse kit is delivered to customers in a high quality wooden crate, which they can keep as an interesting memento. Despite the extra performance the Abarth Punto Evo esseesse is Euro 5-compliant and comes as standard with the Start&Stop system, MultiAir technology and a gear shift indicator. It returns 47.1 mpg economy on the combined cycle and has a CO2 figure of 142 g/km. The esseesse kit adds around £3000 to the cost of a standard Abarth Punto Evo (£16,852 OTR); the figure varying slightly depending on different regions’ labour costs.